For the days and nights you do make it out, consider going to these first-hand verified as insanely awesome places. You won’t regret it, scout’s honor. 1. Stroll through the Self Realization and Meditation Gardens in Encinitas. 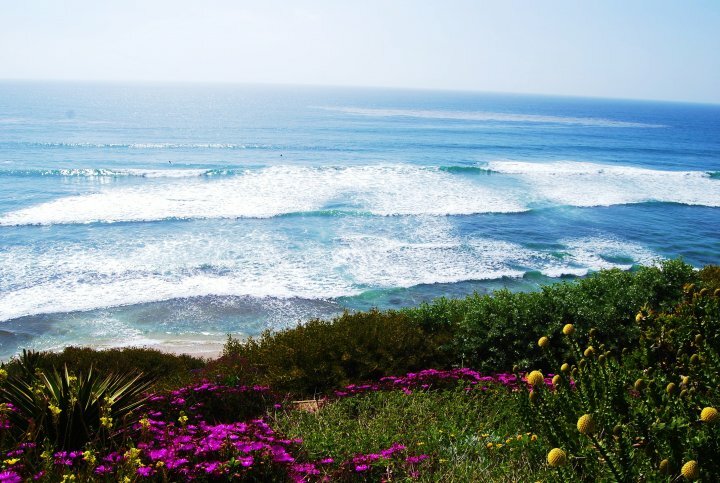 Located on the cliffs of Encinitas is a wonderful sanctuary-like garden that overlooks the ocean. It’s hidden behind the Aladdin looking structure near Swamis. There are shady trees to sit under surrounded by flowers and ponds with koi fish. The perfect day would be stopping for a bite to eat at Swami’s Cafe (a personal favorite restaurant–get the acai bowl or falafel pita!) and walking a short few blocks to the Self Realization Gardens. Followed by a nice swim or evening surf session at Swamis, the local surf break. 2. Go on a Night Hike. There’s something exciting about exploring trails (even if they are the beaten ones) at night… it feels safari like, despite the fact that San Diego’s largest predators are rattlesnakes and coyotes. There’s a trail in Westwood that leads to a waterfall off of Lake Hodges, and it was the nightly go-to activity for me and my friends until druggies got wind of it and my friends and I had to compete with the druggies for space on the rock overlooking the waterfall. The human imagination goes wild in the dark, every creak becomes amplified and every twig snap surely was broken by something terrifying. In my mind, the waterfall in Westwood was about 30 feet tall, soaring rapids, surrounded by greenery equivalent to something you’d see in Avatar. It wasn’t until a few years after my first night hike to this spot that I saw it for what it was — a swamp covered in trash and graffiti with a sludgy waterfall drooling off the rock. I was practically heartbroken! This summer, pick a path you’ve never done before and try to maneuver it at night. I highly recommend the Torrey Pines Bluffs (which may or may not have a rule about going on the trail after sunset… though I’ve never seen it enforced… but I’m not condoning you hike it ;) ) because it is a spectacular experience during the day as well as at night (not that I would ever break the after sunset rule of course!). 3. 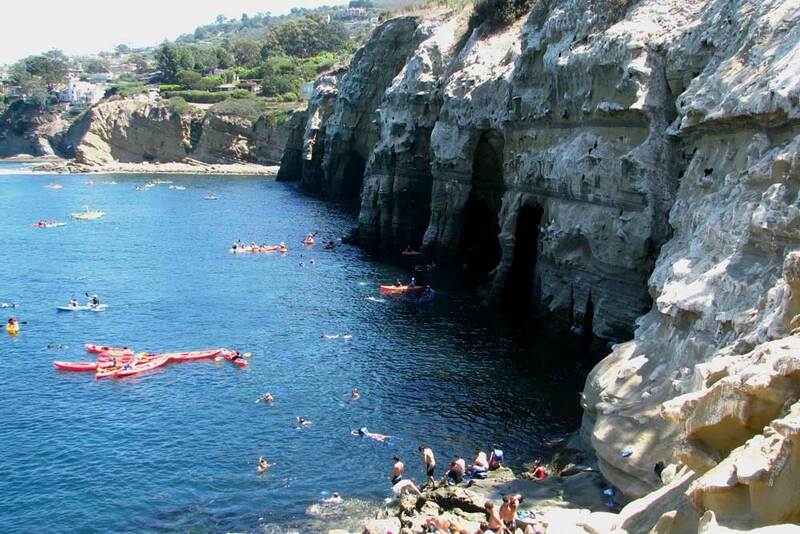 Grab some snorkel gear and explore the La Jolla Caves. Oh look! A wild Garibaldi! I love snorkeling through the La Jolla Caves and seeing all the cool native marine life — even if I know the names of only a handful of them. If you were a fan of exploring tide pools as a kid, you will be in heaven doing this. You’ll even get a chance to swim by some sea lions! Just resist the urge to pet them because they don’t always come across as the most friendly of creatures, despite how funny they look. There is one cave that has what looks like the end of the pier inside of it. Climb onto the pier and explore up the stairs! The stairs go into pitch black darkness and rumors say that at the top, a door opens to a shop located downtown La Jolla! It seems I’ve only ever been when the shop was closed because the door has been locked each time I’ve gone. Regardless, it is an amazing local adventure that everyone should try at least once — especially if you have a brave friend to lead the way through the dripping, Indiana Jones-like stairs (Thanks Jimmy!). A few pieces of advice for the caves — go when it is low tide, only enter in between wave sets, wetsuits help against sharp rocks, and beware of the pigeons that live in the caves — they are like rats with wings! 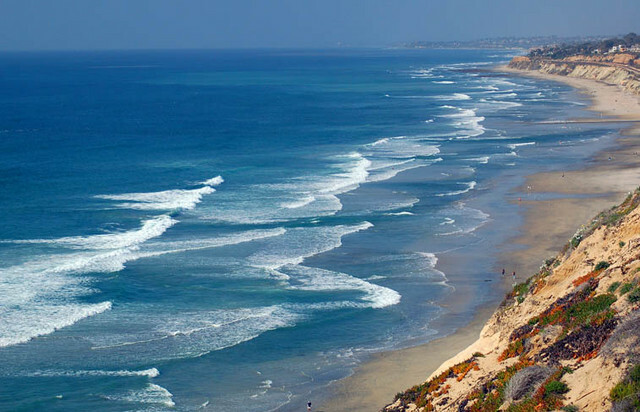 Start out at La Jolla Cove and swim to the right if you are facing the ocean. 4. 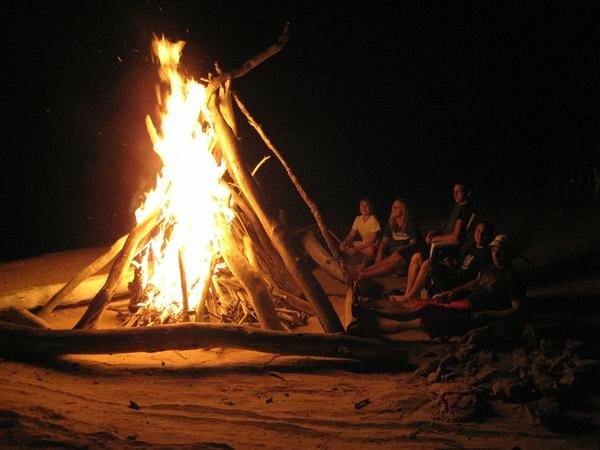 Throw a Bonfire at the Beach. Ahh, the title of this next stop reminds me of my middle school days of eating black carcinogen filled burnt marshmellows. My mouth is watering at the mere thought. Fire pits are easily reserved at Moonlight Beach or La Jolla Shores easily on a weeknight, but head to the beach early if you want to snag one on the weekend. Create memories by having a flaming marshmallow contest by seeing who can get the farthest trajectory on a thrown flaming marshmallow before the flame burns out! (Kidding, I do not condone this after stepping on 5 too many still flaming marshmallows — fusing sand, marshmallow, and skin together) Hotdogs are always a good choice as well and remember not to leave your shoes against the firepit! Can you tell I’ve had a lot of “fusing” experiences at the beach? 5. Go for a bike ride in Coronado! Having a bike will dictate whether this will be a truly free activity for you, but surely you have friends who owe you a favor or seven? Roller blading, skateboarding, and walking are all great modes of transportation around Coronado. Just be sure you cross the bridge in your car and not on foot, or you might have a good Samaritan stop and ask if you are feeling suicidal (not kidding). 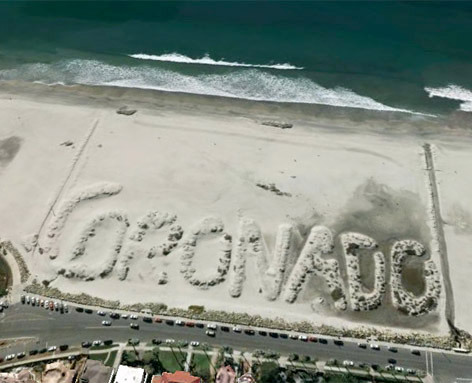 A great bonus will be to hike the Coronado beach mounds and try to see what it spells! I didn’t realize what they spelled until a good friend told me… perhaps spelling isn’t my strong suit? Have you been able to comprehend this post? And the skyline of downtown at night can be quite romantic! Stay tuned for my next series of more budget-friendly activities! What are your favorite free things to do? This entry was posted in Budget Friendly, Travel and tagged activities, budget, caves, free, la jolla, san diego on June 7, 2012 by chantae. 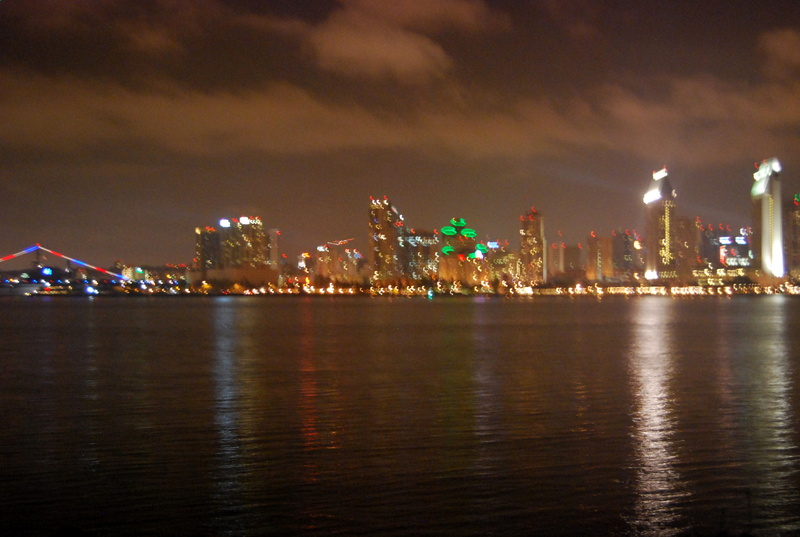 A night hike in San Diego sounds absolutely lovely! This is a really great list of things to do! There’s a lot of things you mentioned that I wouldn’t have thought of.